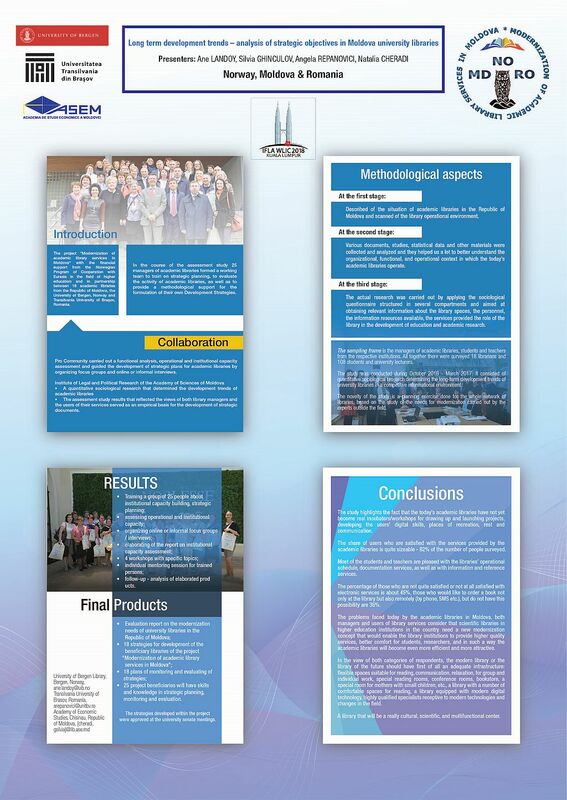 LANDOY, Ane and GHINCULOV, Silvia and REPANOVICI, Angela and CHERADI, Natalia (2018) Long term development trends – analysis of strategic objectives in Moldova university libraries. Paper presented at: IFLA WLIC 2018 – Kuala Lumpur, Malaysia – Transform Libraries, Transform Societies in Session 153 - Poster Session. 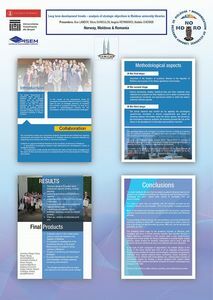 In this Poster the authors present an innovative model of functional analysis performed to assess the institutional capacity of university libraries in the Republic of Moldova. The study was conducted during October 2016 - March 2017. It consisted of quantitative sociological research determining the long-term development trends of university libraries in a competitive informational environment. We assessed opinions of two categories of respondents: librarians and users. They were requested on such issues as library facilities, library staff, information resources, services, the library’s role in the development of education and academic research. Survey findings were reflected in the strategic directions and in substantiating development strategies of university libraries in Moldova. The method employed is based on an original model that can be replicated for other library consortia. The analysis is one of the strategic objectives in the project “Modernization of academic library services in Moldova”, financed by the Norwegian Ministry of Foreign Affairs. The project is a partnership between 18 academic libraries in Moldova, University of Bergen, Norway and Transylvania University of Brasov, Romania. The poster will include information about the deliverables of the project and will contain various images, schemes and figures.